Industry growth rate continues to climb. New entrants into the index are a big part of industry-wide growth. LendInvest are fast becoming a major force within the p2p space. After jumping from 6.01% in November to 7.14% in December, the sector growth rate now stands at 8.19% – the highest it has been since the month of October. This is thanks in no small part to a number of new platforms partaking in our statistical analysis. The growth rate of the Liberum AltFi Index old guard (Zopa, RateSetter, Funding Circle, ThinCats, Market Invoice and Rebuildingsociety) actually fell from 7.14% to 7.06%. The newly-factored-in platforms have now provided 2 months of headline figures, and the growth rate for the industry as a whole can now be deduced with them taken into consideration. A few of these newly-considered platforms are also relatively new entrants to the industry itself. 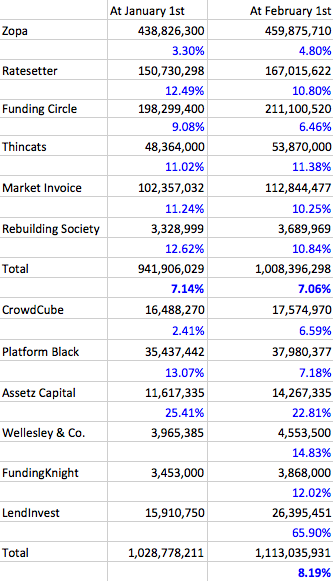 Wellesley & Co. and LendInvest are two fresh faces that already boast impressive net flows of $4,553,500 and a whopping £26,395,451 respectively. We at AltFinanceNews recently included both of these platforms in a report named the Daring Dozen (http://www.altfi.com/downloads/daringdozen.pdf) – a study of twelve bold and innovative platforms which we believed stood a good chance of becoming major players in the alternative finance world. Wellesley & Co. and LendInvest are already there. "LendInvest is now one of the fastest growing P2P platforms in the world. As experienced lenders that have been lending in the short-term mortgage market for over 5 years, investors are understandably excited about our investment proposition going online with the LendInvest platform. As a secured P2P platform, LendInvest provides investors with superior risk adjusted returns, and we expect this to continue to be a very attractive proposition for all involved." Assetz has impressively registered consecutive growth rates of above 20%. It will be intriguing to see if they can maintain this rate of expansion. Scale may hinder growth potential, but the UK’s oldest and largest p2p lender is hardly crawling along. Zopa rebounded from a December growth rate of 3.30% to a January figure of 4.80%. We would usually temper the naturally impressive growth rates of younger companies with a comment about the relationship between scale/expansion, etc., but I’ll forego that tendency with LendInvest. Never mind growth rates, in January LendInvest lent a total of £10,484,701 – a figure comparable with the lending sums of the long-established UK p2p hubs. FundingCircle – the UK’s largest peer-to-business lender – provided a similar £12,801,120 in loans last month. LendInvest will be snapping at the heels of the major players before long. A word in praise of Market Invoice, who have for four consecutive months recorded growth rates upwards of 10%. That sort of consistency is no less valuable than occasionally gaudy but erratic headline numbers.